At any given time, commercial trucks and tractor-trailers are the largest and heaviest vehicles on a roadway. Their enormity makes them extremely dangerous when involved in crashes with smaller sized vehicles. These carriers become even more dangerous when distracted drivers operate trucks. Whether using a cell phone or a navigational device, distracted truck drivers place everyone on the road at substantial risk of property and bodily harm. Truck-related crashes are at an all time high on American roadways. As reported by the U.S. Department of Transportation (DOT), more than 300,000 roadway crashes involved commercial trucks in 2012. More than 100,000 people suffered injuries and almost 3,891 individuals lost their lives. The numbers are particularly alarming for the state of Georgia. Our state ranked fifth in the country with 129 truck-related fatalities in 2012. While the prevalence of these tragedies is due, in part, to the increased number of trucks and trailers traveling the highways, it is also the result of distracted driving. When truck drivers are negligent and fail to operate their vehicles in a reasonably safe manner, the risk of an incident dramatically increases. 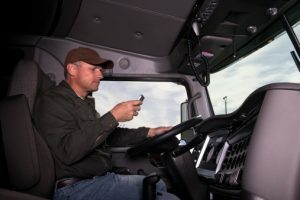 According to the Federal Motor Carrier Safety Administration, truck operators are six times more likely to be involved in a vehicle crash when dialing a mobile phone. The risk jumps to more than 20 times more likely when truck drivers text while operating the vehicle. As explained by the FMCS, texting requires a vehicle operator to take his eye off of the road for approximately 4.6 seconds. For a truck operator driving 55 mph, this is equivalent to traveling the length of an entire football field blindfolded. Distracted truck drivers pose a substantial danger to every individual traveling the same roadways. When their negligent actions cause injury, rely on the lawyers of Harris Lowry Manton LLP to aggressively advocate for the compensation your case deserves. Call us today at 404.998.8847 in Atlanta, at 912.417.3774 in Savannah, or complete this contact form to schedule your consultation with a skilled attorney in Atlanta or Savannah.